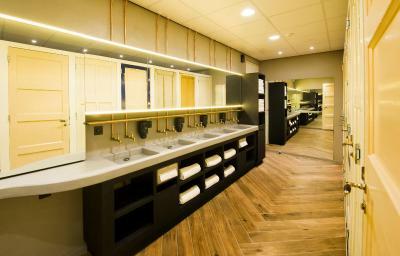 Lock in a great price for CityHub Amsterdam – rated 9 by recent guests! We liked the friendly very helpful staff and enjoyed meeting all the different people. any problems were dealt with promptly and with good humour in. Best showers ever. Having the food Hallen next door was great too! Love the staff too, very helpful and the portable WiFi was AMAZING to have while out exploring in the city! This is a super fun hotel/hostel! It was definitely an interesting, but pleasant experience. I was hesitant about the size of the hubs at first, and though it was difficult to store our large bags, once we figured out a system that worked for us, it wasn't too bad! Plus we were out exploring Amsterdam for the majority of the day, so we mostly only slept in our hub. And there is a large communal space where you can hang out if you want more space. 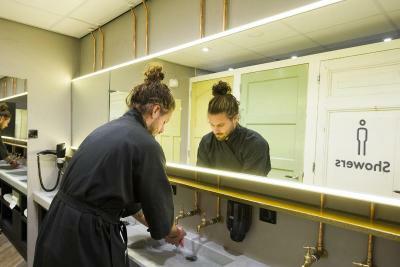 The communal bathrooms also weren't a big deal to me and they provide robes for more privacy. 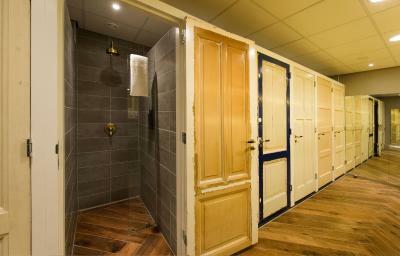 The showers are like individuals rooms, so there is no chance anyone can see (just remember to lock the door!) Overall, my friend and I had a great experience here! Great value for the price we paid for 4 nights! the crew was nice, the automatic checkin, the auto lockers. Everything!! 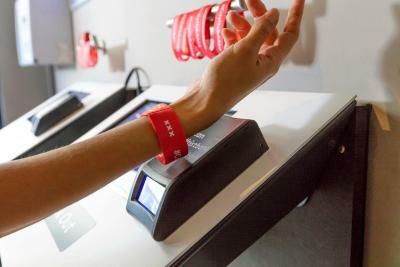 The hub was really great, the bluetooth system to control the lights and put some music, the wristband system, even though is a little small I think is the concept behind it, you get use to it very quickly and start to find it very cozy. 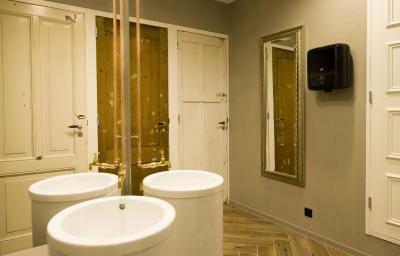 The showers and the toilets were very clean at all times with the right space. The hairdryer was really appreciated :) The location is great too, 30 mins walk to the city centre or just a 3-4 mins walk to take the trams. Supermarket is 5 mins walk, very handy. Super comfy beds/rooms. Very convenient location - can walk just about anywhere! Being able to connect your music to the hub’s speakers was so nice. I would absolutely stay here again. The neighbourhood is cool with lots of cafes and restaurants and a tram is close by which takes you directly to the centre. The staff are super friendly and are always on hand when you have a question or would like some tips on where to go, eat, drink, etc. There is an app you can download when you arrive which allows you to adjust the colour of the lights in your room which is super fun, and you can message staff at any time and get directions to places. And there is good wifi. My whole stay was amazing. It was my first time seeing such kind of hostel. 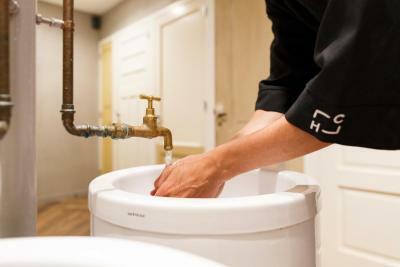 All of the amenities are run via the chip that will be provided and will be billed only after your stay. The staffs are very nice and accomodating The ambiance of the common area was so cozy as well. The room was exeptionally good and high tech. Everyone was friendly, the key was a wristband so I never lost it, the bed was comfortable and facilities were clean with good products. 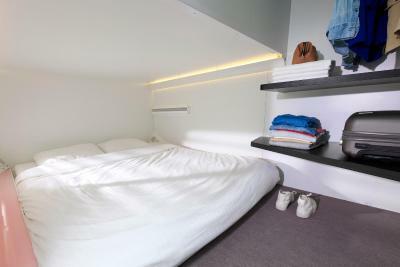 CityHub Amsterdam offers social accommodations in Amsterdam. 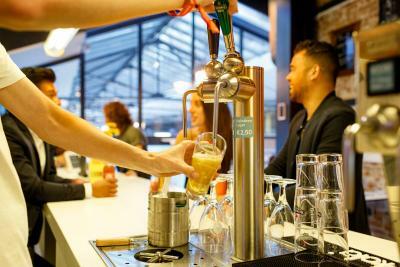 Guests can make their own drinks in the on-site self-service bar. 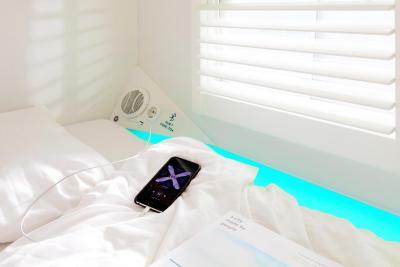 With a mobile app, guests can control their room and chat with other travelers or the CityHosts. The Foodhallen are right around the corner, where guests can enjoy different food concepts and cuisines in a historical venue. Ten Kate Market is 250 feet from Cityhub, while Vondelpark is 0.6 mi away. 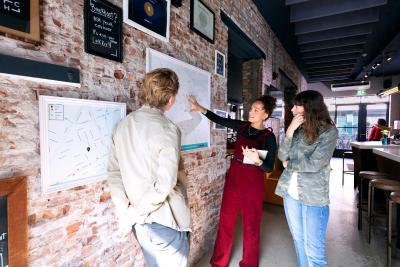 Leidseplein and the Negen Straatjes are all within 20 minutes walking distance. The nearest airport is Schiphol Airport, which guests can reach in 25 minutes by public transport. 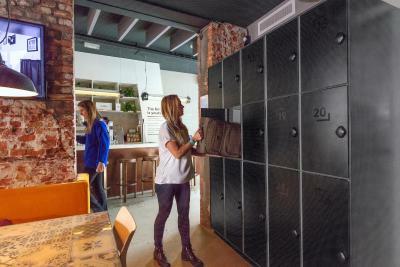 When would you like to stay at CityHub Amsterdam? 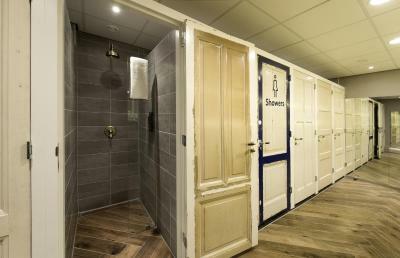 We love hostels because of their communal feel and hotels because of their privacy. At CityHub, we combined the two: more than enough ways to mingle AND your very own, private cabin. We call those cabins Hubs. 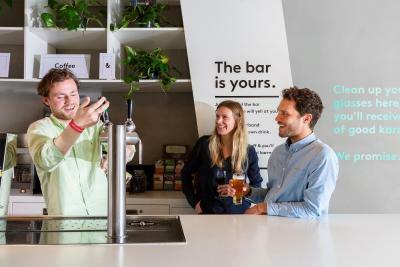 House Rules CityHub Amsterdam takes special requests – add in the next step! ATM card Debit card CityHub Amsterdam accepts these cards and reserves the right to temporarily hold an amount prior to arrival. CityHub Amsterdam accepts these cards and reserves the right to temporarily hold an amount prior to arrival. 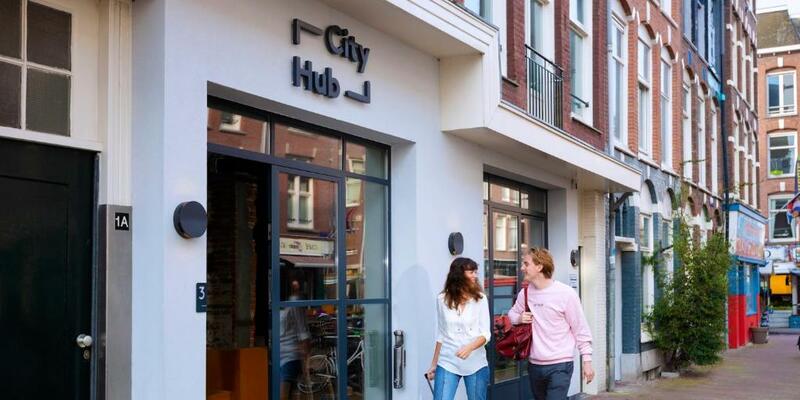 Please note that CityHub Amsterdam does not accept cash payments but major credit cards and debit cards only. 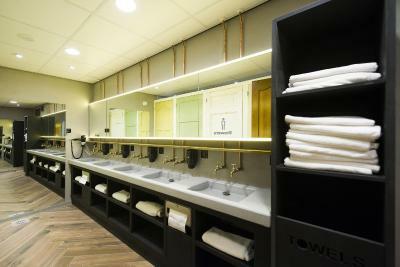 Please note that the CityHub Amsterdam does not accept reservations for more then 5 rooms. The gas bottle running out on Sunday with no spare. One of the women’s showers was broken. Did not discover this until stripped and ready to shower. Very professional staff and the sleeping experience was very interesting. Good location, very easy to get to the tram. The Hub is clean and modern and staff are very friendly and always available to offer help. The rooms are comfy and of a good size and the bathroom facilities are clean and plentiful. The only down side to this hotel is the location. It is quite away from the center. I would personally love one closer as I have been here twice now and absolutely loved it but it includes a lot of walking. 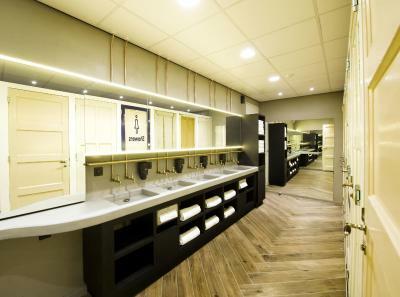 So clean throughout including toilet, showers, the hubs and the reception area. Lovely staff who are very helpful. 24 hour help and service. Use of the bar. Great atmosphere and very quirky! Would totally recommend!! The sound isolation might be improved. 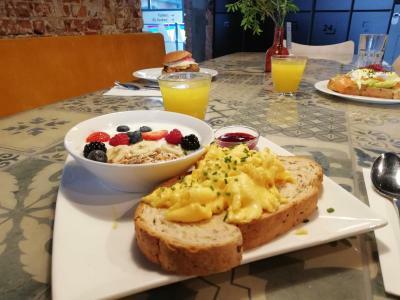 It's an interesting experience, had a great time, staff is extremely welcoming and helpful, the facilities, although shared, are of high quality, very good for couples, feels modern. Good quality for money. This place is funny and cool. Great location. Very friendly staff. All we need for shot stay. Some hosts can be noisy. Good location, staff was always very friendly and helpful, easy process for checking in, all clean and tidy inside the premises. 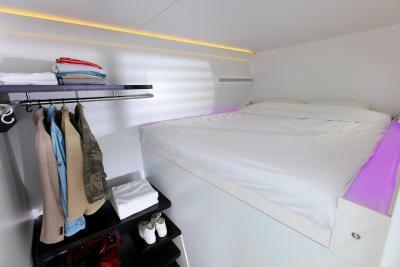 Only if we received a upper bed room instead of lower as I would’ve liked to change as I’ve stayed in lower bed twice now. But apart from that, I didn’t dislike anything. I’ve stayed here before once so I’ve really enjoyed my stay again. Thank you very much for having us. Everything feels so relaxed at this hotel, I love the bathrooms and the beds, also.. the facilities in the hotel. It’s a lovely environment and the staff are very nice also. The bed was very comfy and the staff where very friendly and helpful, I would recommend to anyone to stay here. 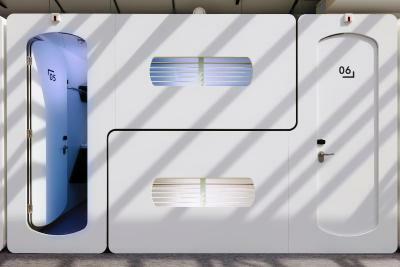 Not your usual hotel, but clean and quiet in the sleeping pods. Excellent place. Near the Food Halen, which is a great place to eat. Also very near from the tram.